You are embarking on a journey to a place and amongst people whose lives are very different from your own. Many aspects of life in Southern Africa will seem unusual. Remember that these are often the same aspects that make an off-the-beaten-track destination very memorable. When traveling in Africa you cannot expect things to always happen on time or in the way that you are accustomed to back home. Often, late rains will wash out roads or bridges, and diversions will be necessary; bushfires can close entire park areas and leave them devoid of game; government regulations can change or be implemented overnight, often leaving the unfortunate visitor in the wrong place and confused. On all trips, the most important item to “pack’” is a flexible and relaxed attitude. Although we will make every effort to stay with the itinerary, we may experience delays or even need to change our schedule. Bring a spirit of adventure, a healthy sense of humor and a willingness to encounter the unexpected, and you’ll find your trip to Africa the adventure of a lifetime. Since the word “safari” is used for a number of widely different types of wildlife experiences, we would like to give you a few guidelines of what to expect during a day on safari. You will be awakened fairly early for a game drive (just after dawn) when animals are most active and visible. At this early hour you eat only a snack or a rusk (a local biscuit) and coffee or tea. Depending upon your specific trip, your return to camp can be any time between 0900h and 1000h. By then you will be looking forward to a late breakfast or brunch. This is followed by free time. The next few hours are the hottest time of the day. So you can take a siesta, write up your diary, read or perhaps swim. The animals will be looking for places to shelter from the heat and are generally inactive over the middle of the day. 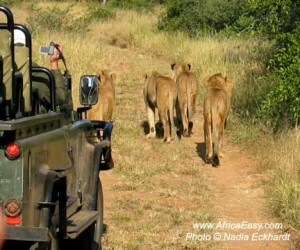 Around 1530h you will go out on an afternoon/evening game drive. Dinner in camp is usually around 2000h. 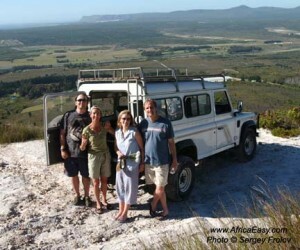 You will travel by rugged four-wheel-drive vehicles, designed for wildlife viewing and photography, which can go off the road into heavy bush in search of animals. Some driving days are fairly long, but this is usually the only way to reach the places of interest. Since traveling in an open vehicle can be windy and cool while in motion, yet hot when stationary, we advise you to dress accordingly (layering clothing is the way to go). Game animals are very susceptible to new and strange noises, so when you see something moving in the bush, inform your leader, and he or she will determine the best way to view the animal. 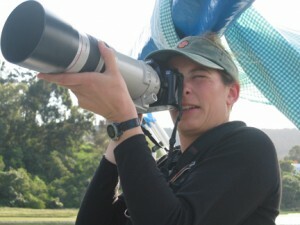 If you yell out, the animal will disappear, and other travelers will not have the opportunity to experience the sighting. Some diligence is required when game viewing in the bush; while your trip leaders may be the best in Southern Africa at tracking and spotting animals, and relating the biology and ecology of the various species, you will see more if everyone in the vehicle or on foot helps keep a lookout for movement and/or game. Your rangers will be very specific about how to act in the presence of big game: quietly, slowly and making to avoid blocking someone else’s view.